Ghost Extermination consists of two modes and 10 themes, with each theme containing 10 stages. - Normal Mode: A basic mode that is playable without any restrictions. - Hard Mode: A more challenging mode that becomes available once the Normal Mode is completely cleared. 1) Select Friend: Select a Friend to summon during Ghost Extermination. 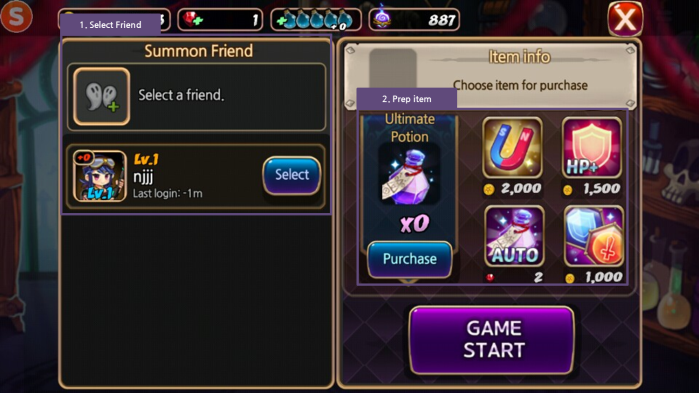 Otherwise, the Summon Friend feature will be unavailable during the game. 2) Prep Item: Items that help to exterminate ghosts. The details are outlined below. - Ultimate Potion: Gives the Hunter a chance to use its Ultimate. Click the [Purchase] button to go to the Store. - Magnet: Gives the ability to pull in Gold and items dropped from exterminated ghosts. - HP Shield: Grants a shield equal to 30% of HP when entering a stage. 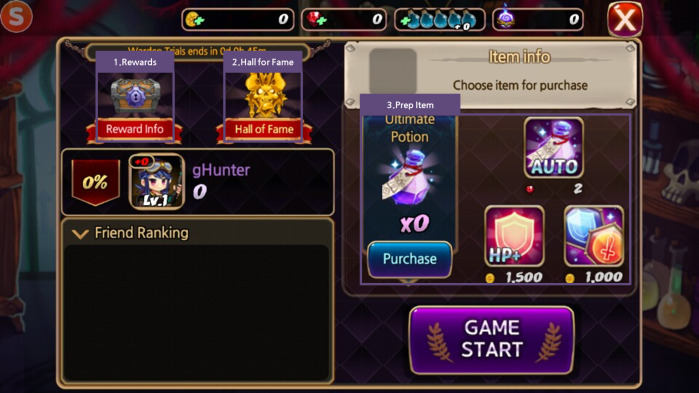 - Auto Ultimate Potion: When hit by an enemy, no HP is lost and Ultimate is automatically activated. - Upgrade Item: Doubles the effects of ATK/DEF UP items dropped from exterminated ghosts. 1) Ultimate Potion: While in possession of an Ultimate Potion, press this button to activate the Hunter's Ultimate. this button when full. Press the button to use the Ghost Attack. 3) Summon Friend: Summon the Friend you selected in the prep screen to aid you in battle for a certain duration. while paused. Closing the pause screen will resume the game after a 3-second countdown. You can send Hunters who are not selected for Ghost Extermination out to explore. 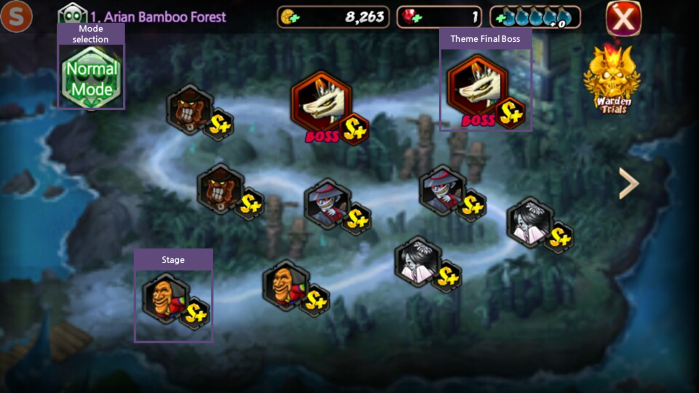 Send a maximum of two Hunters per theme to acquire various rewards. 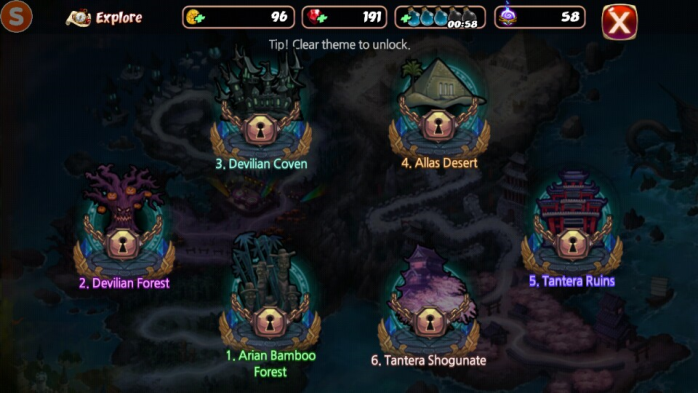 ※ You must clear the corresponding theme in the world map to unlock the area for exploration. and complete it all the way through the last theme. Rewards are given based on the player's weekly ranking. 1) Rewards: Check the reward you will receive according to your ranking. 2) Hall of Fame: The ranking for each Hunter as well as the reward for the Hall of Fame ranking are displayed. 3) Prep Item: Items that help you in battle. The details are outlined below. - Ultimate Potion: Gives the Hunter an extra chance to use its Ultimate. Press the [Purchase] button to go to the Store. There are three quest types, which consist of Main, Daily and Weekly quests. - All Quests: View all available Main, Daily and Weekly quests. - Main Quest: Unique quests that can only be cleared once. time period elapses, the quest is reset and starts from the beginning. - Weekly Quest: Weekly quests are available weekly from 00:00 on Monday to 24:00 on Sunday. 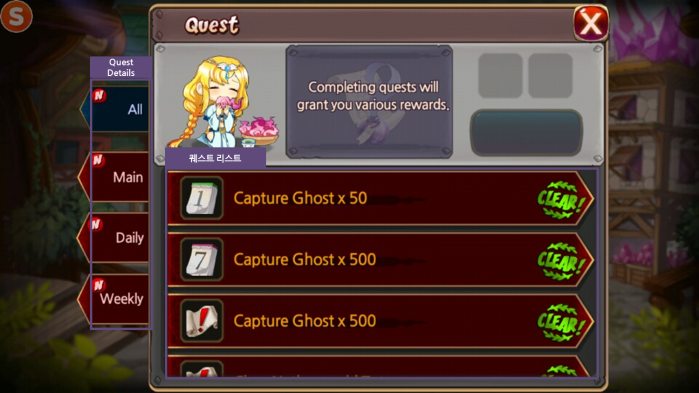 As with the Daily Quest, the Weekly Quest is reset once the time period elapses and starts from the beginning. 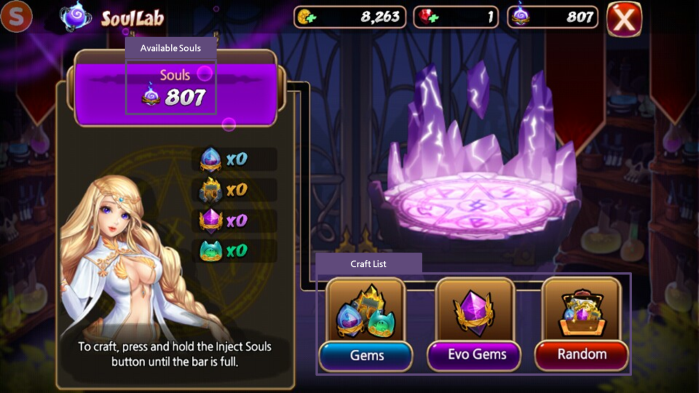 Use the Souls you possess to craft various items such as Upgrade Gems (Hunter/Gear/Guardian), Evo Gems, Gold and Elixirs. Select the item you wish to craft, then hold the [Inject Souls] button to craft it. 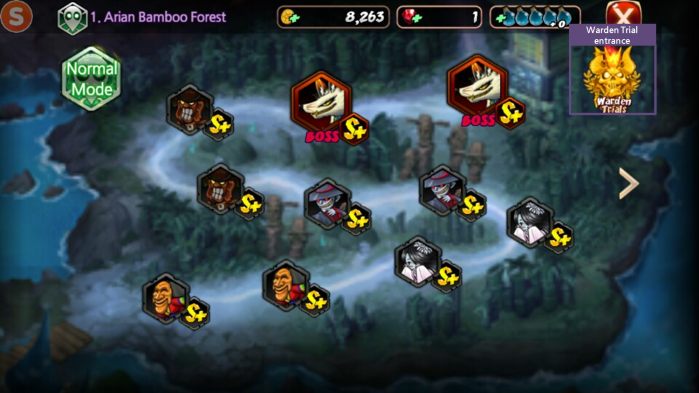 - Upgrade Gems: Can choose between Hunter, Gear or Guardian Gems and craft up to 100 gems at once. 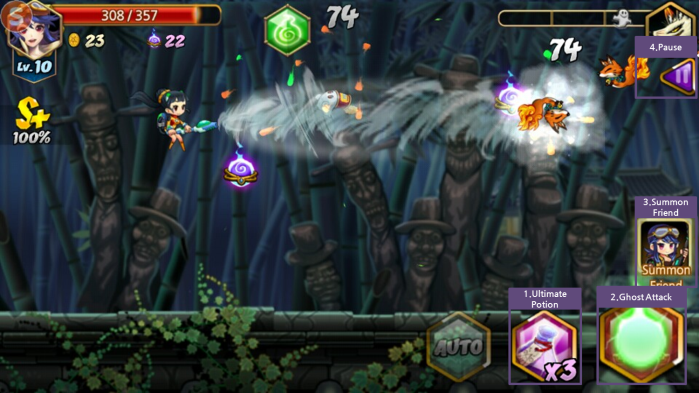 - Evo Gems: Can craft up to 100 Evo Gems at once. - Random Item: Randomly craft Gold, Rubies, or Elixir.